Our household basements are places where a family can gather for some billiards, where family laundry can be done, or even serve as a place to store important heirlooms. Basements are also places where the household pipes can be housed and as a result of this, they can be very humid places. As a rule, mold and mildew can flourish in environments with a humidity level above 80% and as these can both be hazardous for human life, it’s best to prevent their growth whenever possible. To fight the possibility of the appearance of these microscopic household invaders many utilize best basement dehumidifiers to keep their basements at or below 50% humidity, but which best basement dehumidifier should you choose? We’ve compiled a list of three of the market’s best as well as one budget-conscious model. As the inventors of the first self-contained refrigerator in 1916, Frigidaire has a century-long and storied career providing quality home appliances that provide genuine reliability and function. With this history in mind, it’s no surprise that the Frigidaire FAD704DWD is the best basement dehumidifiers on the market today. Just searching through consumer and professional reviews, you’ll find that this unit is something of an industry darling. This customer appreciation, as well as a stoic feature-set, makes this top basement dehumidifier worthy of our #1 Gold Pick rating. 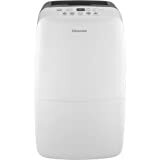 Frigidaire FAD704DWD basement dehumidifier fits well in any basement. Insofar as dimensionality, this unit is only 12.3 x 17.3 x 25.5 inches and weighs around 46 pounds. It has a digital display along the top of the unit (near the top mounted outtake fans) and has several settings for convenience and functionality. Having a loud device running in the background while you are trying to relax and watch some TV can be irritating. Luckily, this Frigidaire basement dehumidifier is one of the quietest dehumidifiers on the market today. Most of the noise caused by basement dehumidifiers happens around the exhaust fan. Some units have fans that are posted along the sides and some have fans that point upwards. As a top exhaust fan unit, this Frigidaire top basement dehumidifier should be a little louder than those with the outtake fans along the side. Amazingly, this unit still manages to not produce much excess background noise despite this positioning. On low and high fan speed this unit competes well with its closest competitors when considering noise output. If you need a quiet top basement dehumidifier, then this is a great pick. The primary function of best basement dehumidifiers is to remove excess moisture from the air, and this unit performs this role admirably. In a 50 foot space, the Frigidaire FAD704DWD basement dehumidifier will take the moisture levels from 90 percent to 40 percent in about 12 minutes. On average, this Frigidaire top basement dehumidifier can remove around 70 pints of moisture from a room in about 24 hours. This reliable rate of moisture removal, while not the absolute fastest in the industry, is still bolstered by the fact that this unit removes at such a good rate while maintaining a low-noise profile. Also, as a rule, those units that might have greater moisture removal rates tend to also be less durable. The majority of best basement dehumidifiers have an internal hygrometer to measure the humidity in an area. This top basement dehumidifier does a pretty good job at judging air moisture, typically being around five to six percent off of the actual air humidity. Insofar as durability and quality build design, this Frigidaire unit performs well. Frigidaire included a brace along the water tank in this unit. Braces along the top of the water tank allow for more sturdiness when hefting the condensate collection bucket from the basement dehumidifier to where you are dumping the excess water. This unit is also constructed of high quality, reliable parts. There is certainly a decent degree of weightiness when you heft this unit and that is typically an indicator of quality construction. This top basement dehumidifier also has a strong additional feature-set. This unit includes a humidistat that will help regulate humidity levels in your basement. Once a desired level of humidity is achieved, the unit will automatically shut off to save energy. If the humidity spikes to higher levels again, the device will turn back on and resume reducing the moisture levels to the values that you have pre-set. When it does fill to capacity, this top basement dehumidifier will also auto shut-off until the condensate collection bucket is emptied. To better help with the management of the excess water that basements sometimes produce, this unit will alert you when a certain level of water in the collection reservoir is reached. This will help you ensure that the basement dehumidifier is emptied regularly when excess water is an issue. There is also a continuous draining feature that allows you to connect a drain pump to the unit that will send the excess water that this unit collects to a dedicated drain. This allows you to run this device for as long as is needed in specifically moist environments. You can get the Frigidaire FAD704DWD basement dehumidifier on Amazon for $219 and Frigidaire offers a 1-year warranty on the unit. When it comes to reviews, this unit does particularly well; 64 percent of Amazon reviewers have granted this device a five-star quality rating. Another 19 percent awarded a four-star quality rating. Altogether, this Frigidaire FAD704DWD basement dehumidifier has received a full 85% of positive sentiment ratings from reviews on Amazon. Our Silver Pick basement dehumidifier has a lot of great features that place it within a very close margin to our Gold Pick unit. Released by Keystone, the KSTAD70B has a great feature-set and provides strong reliability when it comes to moisture reduction. Similarly to the well-reviewed Frigidaire mode, the Keystone KSTAD70B is considered a consumer favorite, with many of the online reviews out there extolling the quality of this top basement dehumidifier. Dimension-wise this unit is 11.3 inches deep, x 15.5 wide, and x 23.3 inches high and weighs about 40 pounds. The output fans are along the sides of the unit and the digital display is positioned on top. There is a water level indicator placed towards the bottom of the unit on the outside of the condensation collection tank. It has four durable rolling casters on the underside to make this top basement dehumidifier easy to move from place to place. When it comes to energy efficiency, this unit does great. Energy Star certified, this unit regardless of continued usage, won’t kill your energy bill. In tests at 50 percent relative humidity, the unit set to high fan speed, and the compressor on, it has tested at only using 590 watts of power, making this unit one of the most energy efficient on the market. Like our Gold Pick, this unit also includes an auto shut-off that when it reaches a pre-set humidity level, shuts off the unit to save on energy costs. This unit is also astoundingly quiet. While fan output systems that are positioned along the sides of a dehumidifier are typically quieter, this unit when measured against several other basement dehumidifiers of both top and side outtake varieties did exceptionally well. As a result, this Keystone unit is simply one of the quietest models of top basement dehumidifier on the market currently. On the air miniaturization front, this unit’s hygrometer is very accurate. Typically, you can expect this top basement dehumidifier to be within two or three percent of the air’s actual humidity, which is very close indeed. When it comes to its key function, moisture removal, the Keystone performed well also. In a 50 square foot room with 90 percent humidity, the Keystone is able to reduce the amount of humidity to 40 percent in about 11 minutes. This speed in dehumidification is very useful when dealing with overly damp spaces such as a basement or cellar. As with the Frigidaire, this isn’t the fastest in the industry by far, but this unit will last you a lot longer than those units that have a faster moisture removal rate. This unit doesn’t have a brace for the tank. This means that you should handle the condensate collection unit a little more careful when disposing of the collected moisture. From a weight perspective, this unit is incredibly light and easy to move from point A to point B. While weightiness tends to mean a sturdier, more lasting construction, this basement dehumidifier will still stand up to more moderate use and last for years to come. In the additional features category, this Keystone unit features a built-in settings memory. If a power failure occurs, the device will restore the most previously input settings when power is restored. When your filter is in need of cleaning, this humidifier will also alert you. Another great feature that this device has is its built-in auto defrost capability. Primarily designed for spaces with little to no heat, this keeps the condensed water that forms in the tank from turning into ice. The Keystone KSTAD70B can be found on Amazon for $192 and has a warranty that covers the first year of this basement dehumidifier’s ownership. Reviewers have overwhelmingly voted this unit highly, with 83 percent giving it a good review; that’s 60 percent at a five-star rating and 23 percent voting it at four. Our Bronze Pick, like all of the other models on our list, is one of the best basement dehumidifiers. Hisense, a state-owned Chinese corporation has been making great appliances since 1969. The DH-70KP1SDLE is an inexpensive dehumidification option that has a good selection of performance features and additional functionality. From a size perspective, this unit is 11.4 inches deep, 15 inches wide, and has a height of 24.7 inches. This is a slightly heavier model as well, at 46.2 pounds. The device’s mobility is supported by four durable caster wheels and a power cord storage area hidden in its construction. From a shape point of view, this device has several rounded edges that reduce the unit’s need for extended space, making this a very easy basement dehumidifier to store when not in use. This Energy Star rated unit will help you manage the job of reducing ambient humidity in the space you choose without being a massive burden to your electric bill. It is designed to use the most minimal amount of power when doing the dehumidification for larger spaces. According to the manufacturer, you can expect a draw of about 746 watts when reducing the moisture of a very humid area (around 80-100 percent humidity), which is less than the power draw of many modern devices. When it comes to its primary use, this basement dehumidifier does a great job at reducing the ambient moisture levels of a fairly large sized room. When tested in a 50-foot square room with 90 percent humidity, this device was able to reduce that moisture level to 40 percent in about 13 minutes. While this may be the slowest on our list thus far, for most practical purposes, this unit will definitely reduce air moisture at a fairly studious rate. This dehumidifier’s hygrometer is the closest of the units on our list to measuring the actual moisture levels of the air in the space it is designed for dehumidification. Typically, there is only a one percent degree of error when this device measures air moisture. Unlike the prior entries on our list, which both have two fan settings, this basement dehumidifier employs three separate fan settings for dehumidification; high, low, and auto. High will be the fastest method of air moisture reduction that you can get with this unit. Low, of course, will do this at a slower rate, and auto will adjust the fan’s rate based on a preset value. If the humidity is at a high number, the device will use the high setting. If the humidity is in the lower range, the device will automatically attune the fan to low power when this setting engaged. This device features a built-in pump which will drain moisture to a drain that is lower than the device, into an area at mid-level, or even upward into a sink. This feature is perfect for jobs where the device is going to be perpetually running and really lends well to its overall versatility. The Hisense 70-pint 2-speed basement dehumidifier has a built-in pump that pumps the water upward to continuously drain out a basement window or into a sink using a standard garden hose. This basement dehumidifier removes 70 pints of damaging moisture per day from spaces up to 1500 square feet operating at temperatures as low as 38 degrees Fahrenheit. The Hisense DH-70KP1SDLE goes for $250 on Amazon and is protected by a one year warranty. For reviews, 61 percent of Amazon reviewers rated this device at five stars and another 16 percent ranked it at a four-star level. Overall, this device does great in regards to positive sentiment on Amazon with a 76 percent approval rate. All of the best basement dehumidifiers that we’ve listed thus far provide reliable, durable, and long-lasting moisture reduction for in your basement or in any area in your home, but sometimes these selections, for some, may seem to be more pricey than might be comfortable. 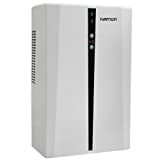 The Ivation IVADM45, as our Ballin’ on a Budget entry, is the lowest priced basement dehumidifier on our list, and while this may dissuade some, it’s still one of the best basement dehumidifiers. While not Energy Star rated like the others on our list, this top basement dehumidifier, as it’s designed to take on lower moisture situations isn’t going to send you to the poorhouse because of a high electricity bill either. As this is a smaller unit, this basement dehumidifier is not designed to work quite to the specifications of the prior units on our list, but it can draw around 25 ounces of moisture per day out of a 2,000 cubic space. It has a two-liter reservoir that is easily removable for quick disposal. Also, like on the other best basement dehumidifiers on our list, this device will stop operation and let you know when it is time to empty the reservoir. This device is by far one of the most portable units available on the market. It’s only 8.6 inches deep, seven inches wide, and 13.8 inches high and weighs only seven pounds without any water in the tank. For the sake of convenience, there is even a handle along the back side of the unit that’ll make this basement dehumidifier easy to carry from room to room. Performance-wise, this unit uses Peltier technology, which has no moving parts, to provide very little noise while granting very trackable performance. If you want a certain level of moisture, with this basement dehumidifier, you can even pre-select a humidity level that you will be most comfortable within your basement. As this is the Ballin on a Budget entry, you can expect value in this unit. Available on Amazon for the low price of $100, from a price-to-value perspective, this is also one of the best basement dehumidifiers on the market. Of all of the reviews for this unit, more than 50 percent of all users on Amazon have granted this device a positive star rating. While it might not have all the bells and whistles of the larger named units, this unit is certainly perfect for reducing moisture in most basements. Simply put, this is what we buy the best basement dehumidifiers for. When searching for a unit that will reduce moisture levels, be sure to know how fast the device you’re looking into reduces moisture. The best basement dehumidifiers should be able to reduce 90 percent moisture to around 40 percent in less than 15 minutes. Some do this much faster and this will also vary based on the size of the room but there are a plethora of dehumidification sites on the Internet that test how well these devices function in their primary role. A hygrometer is an instrument that is used to measure the moisture content in the atmosphere. This device is included in the best basement dehumidifiers and these types are designed to measure the overall humidity in much smaller space such as a room. As a rule, these aren’t perfect for getting an absolutely precise reading, but some devices come very close to the actual percentage. When searching for a top basement dehumidifier, be sure that the hygrometer can at least measure humidity to a 5 percent margin of error. No one wants to run a dehumidifier in their basement to avoid or fight the damage that can be caused by mold and mildew and then find that they have tacked on a much larger energy bill that is typical. Many of the best basement dehumidifiers on the market follow the Energy Star rating system. As a rule, to certify for an Energy Star rating, an appliance has to provide 20 percent savings over the minimum standard of power. Also, finding a device that employs an auto shut-off function can really save you money on your energy bill as they shut off when a pre-selected humidity level has been achieved. Finally, those devices with an auto setting for fan output also help modulate energy usage by powering the fan to full power when it’s needed and lowering the fan to low power when the humidity levels are closer to optimal. Additional ambient noise can cause a lot of stress when you’re trying to relax. A basement dehumidifier that is loud will force you to talk louder, raise the level of your television, and simply cause greater irritation. Many devices on the market are designed to run quieter than some of the devices of yesteryear and that’s a great feature to ensure peace of mind. Having additional bells and whistles can really help your situation when selecting the best basement dehumidifiers. Is the area where you want to reduce moisture cold? Then, a unit that has a low-temperature operation and tank defrosting might be useful for you. Is there a higher level of moisture that will require your device to run for longer periods to normalize the ambient humidity? Then, a device that has the option of emptying automatically into a drain or a sink might serve you better. Is the moisture level of the area that you intend to use your basement dehumidifier in need constant moisture adjustment? Then, a device that employs a preset moisture level can be used to keep your area in a certain range of humidity. Dependent on capacity, these devices can be heavy or relatively light. As a rule, a 70-pint unit will be in the 40 to a 50-pound range when it comes to weight. Unfortunately, this already heavy size only increases when you add a full condensation collection tank, so if you have problems lifting one of these types of units, consider purchasing a smaller one. Even heavier units can be easy to move from place to place if they include durable casters along the bottoms of their chassis. These casters are wheels that make moving these sometimes heavy items easy, as long as there is a flat surface to glide along. Finally, some units have handles that may make transporting these types of appliances much easier. The process of reducing moisture in a basement or another room is sometimes imperative. Mold and mildew can cause a large amount of harm to the people who live around their spores. The best basement dehumidifiers can make any environment unfriendly to these types of fungus and completely hinder the spreading of the dangerous spores. This list of units that we have provided all possess traits that will ensure that even the most humid areas of your home can do dehumidificarion quickly and easily at a low cost. When searching for the best basement dehumidifiers, take a look at our list of pre-purchase considerations and execute the proper due diligence and you will make a purchase that will make you happy.